Behold the champion in all its glory! All hail Project Dank! Again! We realize that not all of you who follow us do so on social media, so of late, there were some newsy tidbits on good old Facebook that some of you might have missed. Think of this as a little social media news roundup while we get the jam-packed Week Ahead in Beer and a feature on Three Rivers ready for the next weeks. Back in 2014, La Cumbre brought some serious bragging rights to New Mexico when its Project Dank won it all at the Brewing News National IPA Challenge. Over the next two years, it was Bosque and Scale Tipper taking the crown, all while keeping New Mexico in the spotlight. After Scale Tipper was dethroned back in the Round of 32 this year, it seemed as if the title could end up leaving New Mexico. Thankfully, Project Dank was back at full power. La Cumbre’s hop bomb of hop bombs defeated Lawson’s Finest Liquids’ Hopcelot IPL in the Final Four before overcoming Lynwood Brewing’s Hop Sauce in the championship match on Monday, making it four straight titles for the state of New Mexico. How impressive is this? Well, prior to this little run of dominance, no state had ever won back to back, no brewery had ever won back to back, and no brewery had won more than one challenge. New Mexico now has four straight titles, with two of its breweries winning two apiece. To heck with the West Coast IPA style. It’s time to just call it the New Mexico IPA style. It’s the best damn style in America, and it doesn’t need to be from a coast. As you know, a car crashed into our building on January 1st causing our space to be red tagged by city officials citing safety concerns. After over 10 weeks our landlord has not approved the contractor for the work or have yet to retain a contractor to execute repairs. Once authorized, repairs are quoted to be an additional 10 weeks. The landlord’s blatant disregard for the severity of the forced closure has cost our employees their livelihood and your continued patronage. It seems the big California based property management company and the big Florida based landlord have little concern for our small New Mexico business. That being said, we have made the difficult decision to close and look for a new home. It has been a pleasure to have been a part of your neighborhood, but the time has come for us to call another place home. In the last 7 years we have seen your children grow up, we have been a part of your first dates and later included in the weddings, even our own children have learned how to ride a bike in the dining room and throw dough in the pizza pit. You have trusted us with your field trips, birthdays and anniversaries. We have met some of the most amazing people through the years, including some of our closest friends today. Thank you for your stories, memories and incredible support! We have a couple of locations in mind, but if you have suggestions, feel free to PM us. As soon as a new lease is signed, we will let you all know where the party will continue. Yeah, this is a major bummer. Pi was just seemingly hitting its stride and finding its niche. We wish Greg and Nicole all the luck they will need in finding a new location. It will certainly not be an easy thing to pull off, but we remain confident that they will make every effort to bring their brewery back. It will probably be quite a while, though, before they are making beer again. Not much has changed since our last edition of Beer Notes, but there are a couple items that we needed to pass along. As some of you may have already heard, Bare Bones Brewing has hit a little speed bump with our progress. Our anticipated April 2017 opening date will be pushed further down the road as we explore some new location options. Unfortunately, we were unable to come to an agreement with the new property owners in regards to how we would run our business. We were not given the same lease terms and other businesses within the same complex seemed to have more say over what we could and couldn’t do, which led us to make the very hard decision to cut our losses and move on, to find a location that would be better suited to the friendly, family, community atmosphere we are looking for. We appreciate the many hours that volunteers put into cleaning and renovating the space. It hurts to leave all that hard work behind, but as with everything in life, we live, we learn, and we come out a little better in the end. Stay tuned for updates as we move forward. Cheers! Let this all be a lesson to anyone who thinks it’s easy to open a brewery in this day and age. We will keep an eye on any future announcements from Bare Bones about a new location. Anyway, that is all for now. If anyone needs me, I will be at one of the Marble taprooms later to indulge in the new Woodshed Double Red, which is basically a barrel-aged Imperial Red blended with regular Red Ale. That is just the kind of beer to help us all survive a Tuesday. Tuesday, November 8 was a day that will likely go down in history as the Election Day that marked the end of one of the most divisive presidential campaign seasons …. not to mention one of the most unprecedented election results in American history. I confess that it was also a day where I was glad to have a distraction from the political process (after voting earlier in the day, of course). That distraction was Pi Brewing on Albuquerque’s West Side. I had suggested the date to Greg Villareal, head brewer and co-owner with his wife, Nicole, a week or two prior. At the time, it hadn’t occurred to me that we had picked Election Day. If Election Day 2016 becomes one of those days that you will always remember what you were doing, even years later. I will remember hanging out with Greg and Stoutmeister at a table just far enough away from the TVs in the bar area that the “Trump this, Trump that” and “Hillary this, Hillary that” blended together into a spectacular white noise. Greg was gracious enough to host me on my first interview since becoming a contributor to the NMDSBC, and I was also fortunate to have Stoutmeister providing moral support. As it turned out, distracting me really wasn’t difficult at all. Apparently, the trick is feeding me pizza and pouring various delicious beers down my throat. Somebody must have tipped off Greg, because this is exactly what he did. He also discussed this past year’s challenges and successes at Pi and provided some insight as to what the future might hold. Regular readers might recall that Greg and Nicole’s business started as Nicky V’s Pizzeria before adding the brewery next door a couple years ago, followed by a complete re-branding and combination of the two under the name Pi Brewing. Greg explained the further evolution of the business over the past year since the re-branding in February of this year. The beer board at Pi greets you right as you walk in the front door. Greg jumped right into describing some of the sour beers that he has been passionate about this past year. “The first one we did was a gose, a key lime gose, and that was more of a kettle sour then like a traditional multiple bacteria yeast fermentation, so that was just a really clean kettle sour and it was popular,” Greg said. “After that I was like, ‘You know what? This is kind of cool, why don’t we try actually doing some barrel aging and see what happens?’ That’s when we kind of went down the path of doing a more, you know, traditional sour in barrels. The Pi customer base has been receptive to the sours. Greg’s passion for brewing was palpable early in our conversation and it was equally balanced with his awareness of the challenges that are inherent in running a small brewery. While space might be a limitation for any small brewery (or even a big brewery, just ask Marble), it seems that sour beer further amplifies the challenge by introducing additional considerations related to cross-contamination and barrel storage. Greg suggested that, while he has no intent of focusing solely on sour beer, he is considering the possibility of isolating the sour brewing in a separate facility. Taproom potential, all right, now we are talking. That’s right, Pi Brewing is not shying away from expansion. Why not take it a step further and get Pi’s beer in bottles this upcoming year? There is a second beer board above the taps. Sour beers are still being produced only in limited quantities around Albuquerque. They remain a sort of final frontier for local brewers. Greg made it very clear that, in spite of the challenges, he does not intend to put anything on tap that is not up to snuff. 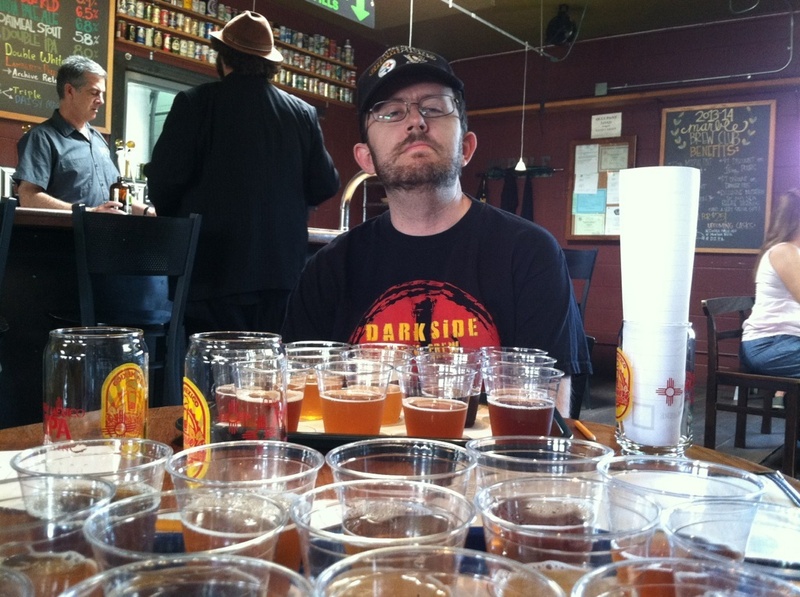 He also has a lot of respect for the quality of brewing in ABQ, which seems to further elevate his standards. Greg’s standards and expectations were also evident in his comments about working this past year to ensure that Pi was putting out enough beer. Furthermore, it’s good to see that Greg isn’t just a passionate brewer but a passionate supporter of our local craft brew scene. During our conversation, a couple specific goals were mentioned for this coming year. The first was a result of my prodding about the possibility of an in-house Pi Brewing beer dinner. Greg’s wife Nicole is a step ahead of both of us on this one. The other specific goal, which Greg brought up himself, is the effort to enter Pi’s beer into more competitions. Last, but not least, a significant Pi success from this past year that demonstrated their effort to be involved in the community, and a source of pride for Greg, was the founding of a meetup group. Those of you who have not had a chance to make it out to Pi Brewery, make it happen and give Greg some feedback on his beer. He will appreciate any constructive criticism. If you are a sour lover, then you might find a new favorite. If you have yet to find a sour that you liked, this might be the place where your luck changes. Either way, you are bound to find something you like from the eight house beers on tap, plus do not forget about the selection of Italian entrees. We didn’t have much time to discuss the food, but I would be surprised to find someone who couldn’t pick out a pizza or pasta dish on the menu that fails to satisfy, or doesn’t match up well with a beer. Thanks again to Greg for being a great host and we wish him, his wife Nicole, and Pi Brewing the best of luck in this upcoming year. Alibi on Tap is the newest beer festival to pop up in Albuquerque. Beer festival “season” is in full swing, and it is easy to get overwhelmed and suffer from fest overload. And yet, Albuquerque welcomed another festival to the late summer/fall lineup back on Saturday. The new Alibi on Tap at the Albuquerque Rail Yards featured some new breweries in attendance, so I really didn’t want to miss out on this opportunity. Plus, although I know there is much contention surrounding brew fests held at the Rail Yards, I personally love the venue as an event space. Because we took the noon Rail Runner train from Los Ranchos, we had about four hours of time to kill before the festival started. First, we trekked over to the open house for the New Mexico Steam Locomotive and Railroad Historical Society. This event was conveniently located near Bow & Arrow, so of course we stopped in for a pint. We had one of their seasonal beers, and it was fantastic, perhaps my favorite of all the beers I have tried at Bow & Arrow. It was Bury My Heart Belgian Pale Ale, number four in a four-part pale ale series. This day was already starting off well. We still had some time before the event, so prior to walking over to the Rail Yards, we headed over to Duel on Central. While enjoying a goblet of Fantin (apparently there was an unintentional Belgian Pale Ale theme for the day), we were approached by a visitor from Las Vegas, Nevada. It was his first trip to Albuquerque and he was in town for a week-long convention at the Hyatt. He asked for advice about things to do nearby. We told him about Alibi on Tap and he seemed interested. It was one of the more relaxed festivals in recent memory. The weather was absolutely perfect, so there was no overheating (this can be an issue in that space). I enjoyed the reasonable entry fee and the limited amount of sampling tickets with a longer time to sample. The older I get, the more I tend to shy away from the free-for-all mentality at some beer fests. If attendees were so inclined it was possible to purchase additional samples as well as full pints of their favorite beers. Because it was a new event, and I think perhaps because there are so many festivals this time of year, the crowd was particularly manageable. We arrived near the beginning and did not have to wait in any lines for entry or sampling. I was most interested in sampling the offerings from the two newest vendors, Palmer and Dialogue. It was both surprising and promising that Dialogue was in attendance on their opening weekend. Sure enough, about 30 minutes after we arrived at the festival, we spotted “Vegas Bill.” We spent our entire remaining time there showing him around the different vendors and explaining the breweries and beers to him. It was actually quite a refreshing experience, because he had no prior knowledge, so there was no, “Them again? Been there, done that” attitude or preconceived notions. We were able to gain new perspective, as well, through his eyes and he really seemed to appreciate the experience. We left feeling quite proud of our stint as unofficial beer ambassadors. Those of us lucky enough to be part of the first 100 tickets sold received a 32-ounce growler to “fill with your favorite beer.” You did have to purchase the actual beer to fill it, which was not explained in the promos, but it was sold at a reasonable price. If the indicator for our favorites was what we chose for our two growler fills, here were our choices — Pumpkin Pi from Pi Brewing, and Motorbrreath Smoked Porter from Starr Brothers. Enjoy fest season, everyone! And, please, remember to take advantage of alternative transportation. Your choice for the best beer name of 2015 was Red Door’s Baby Got Bock. Here is the full list of beers, now including the breweries they represented. Considering that the usual most popular breweries are way down on this list, we would like to thank everyone for just voting for the names. Good luck to our local breweries in topping these names in 2016. The new Sidetrack Brewing may already have their top candidate on tap in the 3:10 to Belen Brown. Thanks again to all who voted. This was fun. We will have to do more polls like this in the future, but fear not, we will never let this site turn into a “listicle” page. That’s just lazy. Oh, and for the record, I voted (only once) for Hoppenheimer IPA. The history buff in me could not pass up that one. Starr Brothers Brewing is moving closer to opening early in 2016. Starr Brothers Brewing is going back to the old school, opening a true brewpub in an era where kitchens have been eschewed in favor of food trucks. The forthcoming brewery is located on San Antonio east of I-25 in the San Antonio Commons retail center. If you reach San Pedro, you have gone too far, but the bright yellow sign is hard to miss. As I drive up and down San Antonio almost every day, I have been keeping a close eye on Starr Brothers’ progress. Based on what I saw with my own two eyes, plus some pics on Facebook, I contact the brewery about an advance tour. We matched up our schedules Wednesday afternoon. Owner John Starr, brewer Rob Whitlock, and general manager Derek Minero were all on hand to show me the almost-but-not-quite-ready location. By all accounts, it could be ready in a month, but more likely after that. As any brewery owner can tell you, putting an exact target on opening is something best reserved for as close to that date as possible. The kitchen, in fact, figures to be ready before the brewery is done, so Rob said they will likely open the restaurant with some initial guest taps while his first brews are being prepped. The star motif is already up on the bar. John, a Navy veteran, said his background is in commercial sales. He has done a lot of traveling, all of which inspired him to attempt to launch a true brewpub in a crowded craft market. The full kitchen setup is not one that many of the other new breweries are planning to attempt, though Quarter Celtic will also be going that route. Starr Brothers will have a restaurant license, which will also open things up to carry things like wine and champagne that is made outside of New Mexico. John reiterated, though, that they will focus heavily on the beer. To handle the restaurant aspect and the brewing aspect, Rob and Derek were brought on board. Derek has served as the manager at the Il Vicino in the Northeast Heights for the past eight years. Once that glycol chiller is up on the roof, there will be plenty of room inside the dining area. Rob is an award-winning home brewer who just retired from a 30-year career as a plumber. He has also assisted on brewing projects at Boxing Bear. “So, Rob here, who’s our brewer, was recommended to me by a family friend who’s also a small brewer,” John said. “Charlie Sandoval over at Pi Brewing,” Rob added. Rob and Charlie were old friends with the Wart Hogs home brewing club in Rio Rancho. Rob said he will brew solo to start with at Starr Brothers before thinking about adding an assistant. “To start off with, yeah,” he said. “I want to get the system dialed in and everything. Rob plans to have an IPA on tap at all times, with other classic styles available, including a few on tap that are not always available in town. Starr Brothers has a 7-barrel Premier brewhouse that is almost ready to go. Rob has four fermenters and serving tanks at his disposal, three of each at 7 barrels and one each at 15 barrels (those will be for the IPA, he later told me). They just received their glycol chiller, which will be installed on the roof, and Rob is handling all of the installation and plumbing in the brewery, since he does have 30 years of experience in that field. The 7-barrel brewhouse features a state-of-the-art control panel. John said he also wants to have a staff that is knowledgeable about beer, or at least is willing to learn. That will in turn help out the restaurant aspect in terms of helping customers pair the right beer with the right food. That in turn can help keep the staff happy. The interior of the building will feature a spacious dining area, plus a sizable bar in the center. There will be TVs present for sports fans; expect a lot of hockey and soccer games, which the staff loves, though they will flick the channel if you ask nicely to watch football or baseball instead. There will also be an outdoor patio for the warmer months ahead. Soon there will be beer here. Soon. Assuming there are no further delays with the construction or in terms of permits/licensing, Starr Brothers is aiming for a spring opening. They will keep us updated and in turn, the Crew will keep all of you updated on their progress. We look forward to grabbing a bite to eat and a pint in the near future. I just had to promise the staff we will not let Brandon wear his Chelsea kit. They are Arsenal fans, after all. Thank you to John, Rob, and Derek for taking time out of their busy day to chat. Good luck to Starr Brothers Brewing, and welcome to the Albuquerque craft beer scene!